tegen racisme en voor vrijheid van beweging! At this very moment multiple places in the world are the backdrop to humanitarian disasters such as war, structural violence and bitter poverty. Many people have left their homes behind in a search for a saver, a better life. Some of these people come to The Netherlands in search of a safe haven. We believe these people deserve our solidarity, we believe that all people should be able to move freely throughout the entire world in search of safety, freedom and happiness. Unfortunately this turns out to be different in practice. The debate hardens. Refugees are often ‘welcomed’ with fear, hate and distrust. Politicians use ‘facts’ that turn out to be false to create a division between ‘us’ and ‘them’. So called ‘worried citizens’ paint racist slogans on houses, attack refugee shelters and are hatemongering against people who are already in dire need. .
We are worried too, worried about the de-humanisation of large groups of people in the public debate, worried about increasing aggression towards migrants and worried about the fate of the many people who have left their homes in search of a better life. Can’t we think of a better answer than the unwillingness to offer people a new home? There certainly is an alternative. In the short term we should open our hearts and show our solidarity towards people fleeing. In the long run we should replace the tendency to think in terms of first- and second-class people with a more equal division of power and wealth throughout the world. Instead of reinforcing borders and differences between people, more social equality will prove to be a solution to many social problems. It is therefore time to send out a strong collective signal. 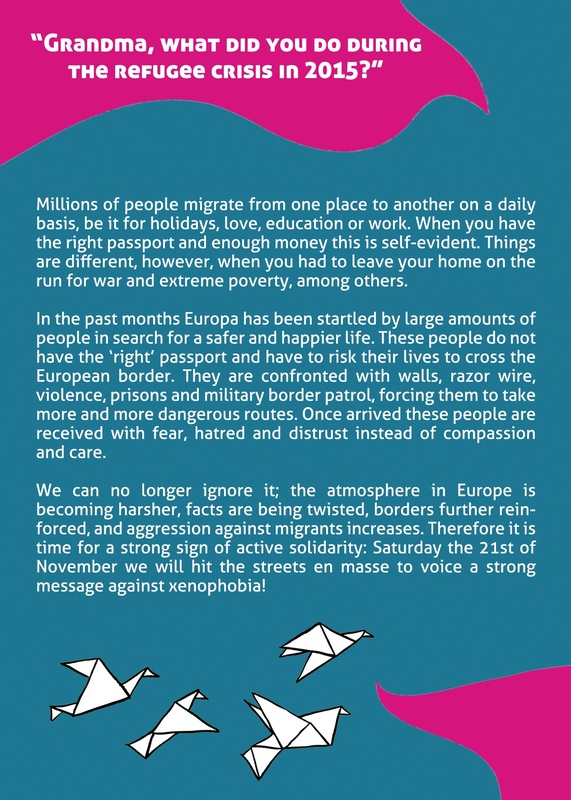 A signal in favour of solidarity, for freedom of movement and against xenophobia. So join the demonstration on Saturday the 21st of November. We are meeting at the Van Schaeck Mathonsingel in Nijmegen at 14:00. Come along, bring your friends and family! Let’s show some hospitality!